Because it was rain when I visited SANOMAGIC last time, I came again for riding the Mahogany Bike No. 13. Sueshiro is now testing this bike until delivery. The technical problems of the past mahogany bikes were completely solved in this bike. the lower part of the frame elastically deformed toward left. and the frame assist effect. Starting running is very light. Everybody will be surprised. The elasticity of the frame did not deteriorate steering. Mahogany Bike 13 ran at 32 km/h when I applied the same power as when I run 27 km/h with my road bike. Most of vibrations from the road surface was canceled by mahogany parts. I could drive lightly Bike 13 at 43 km/h. I felt it as if I was running on a wooden bow. The most important characteristic of this bike may be the reduction of exhaustion during running a super-long distance. between his home and the Tsukuba circuit. Bike 13 must have a stronger frame assist effect than that of MWR-T1. Mahogany Bike 13 offers comfort and silent driving. Drivers can purely enjoy running without being disturbed by unnecessary information such as vibration. The combination of the integral seat post and thinning of the downtube was successful. The relation between performance and various parameters of mahogany bike was tested and recorded. Accordingly, Sueshiro can produce the best bike suitable for each of various owners. I can not sufficiently explain the comfort of the mahogany handle. Vibration from road surface decreases by way of the mahogany rim, the mahogany front fork, and mahogany handle. Nevertheless, steering force is directly transmitted to the front wheel. Inner gear may be unnecessary if you don't attend hill-climb races. Sueshiro records data by a cyclecomputer during driving Mahogany Bike 13 under various conditions. One of characteristic features of Mahogany Bike 13 are chamferings at both sides of the top tube. Hidden appreciation point. It looks like an Achilles' tendon. Bottom bracket portion swings to the left and to the right during running. The heart or the spade? The chain stay and the seat stay can increase elasticity by shaving if further frame assistance is necessary. The necessity will be examined after one year. The saddle of Mahogany Bike 13. Most of the technical problems have been solved. The saddle height can be adjusted by the height of a spacer. Mr. Chomei pointed out that the shapes of the front and rear valve caps were slightly different from each other. Diners Club magazine introduced Mini Wheel Mahogany Bike MWR-T1. Sueshiro was asked to produce a round mahogany table of Japanese style. 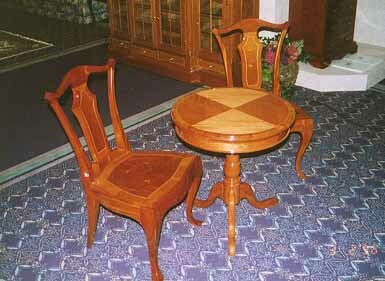 This is another mahogany round table of the European style.